Elegant looks meet phenomenal tone. 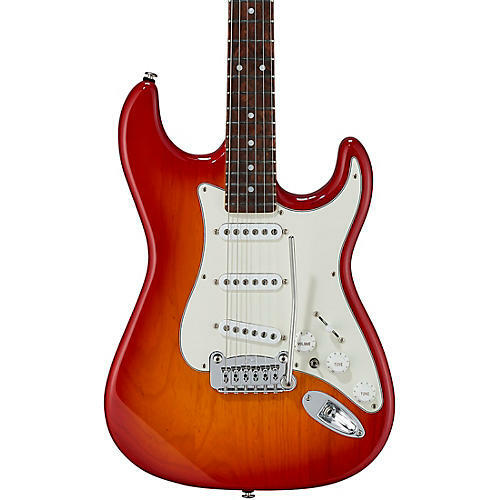 When Leo Fender and G&L first introduced the S-500 in in 1982, it was packed with innovations Leo had developed over the decades since his creation of the traditional double-cutaway bolt-on-neck guitar in the 1950s. The Fullerton Deluxe S-500 brings you that guitar, bundled with some of the most popular options from G&L's individual build choices. From the wide-range MFD (Magnetic Field Design) single-coil pickups, with their robust output, sparkling highs and meaty lows, to the new Dual-Fulcrum tremolo bridge, renowned for its silky smooth action and and tuning stability, the S-500 was a true step forward in electric guitar design. The icing on the cake was Leo's new PTB (Passive Treble and Bass) circuit, which greatly expanded the range of available tones on the instrument, as well as the Expansion Switch that enabled new pickup selection variations beyond the normal 5-way switch. Available in stunning Blueburst, Cherryburst and Old School Tobacco Sunburst finishes that set off the grain of the solid swamp ash body, the guitar comes with a premium hardshell case. Get your Fullerton Deluxe S-500. Call or click to order now.